My goal for August for ALYOF was to make the needed decisions and get started on hand-quilting a quilt. I'm happy to report that I decided to baste the quilt using a long-arm machine; I decided to use Quilters Dream Cotton batting; I decided to not use a hoop; I decided to try a rocking motion quilting stitch. And, yes, the hand quilting has begun, although it's very hard to see in the picture. I can tell you that my quilting will not win any awards. Only a few stitches got lost on the back. It's a blessing that the stitching doesn't show up more. The back really blends in as well. I will probably put this aside and pick it up again when the weather cools a bit. Working with a quilt on your lap in summer, with no air conditioning, is, well, warm! Be sure to check out all the finishes on either blog, Sew Bittersweet Designs or Fiber of All Sorts. Setting a goal each month is such a fun way to get something accomplished that you've been putting off for far too long! Why not give it a try? Time for a new goal for the month of August. (Can it really already be August?) For the month of August, I am pulling out an unfinished project I believe I started in the spring of 2004. I purchased a quilt pattern and some 30's fabrics from a quilt store in Texas. Unfortunately, while I'm sure I still have the pattern, I have no idea where it is or how to give credit where credit is due. 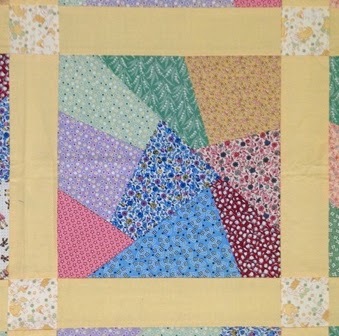 But the quilt blocks were made Buggy-Barn-style, where you stack up several fabrics, make strategic cuts, shuffle the fabrics a bit, and then sew them all back together and trim the blocks. It didn't take too long to sew the blocks together. That was the easy part! But I always thought the quilt deserved hand-quilting. And in order to do that, there are so many decisions......baste? pin? baste with a longarm?......use a hoop? don't use a hoop?......what batting to use?....try to perfect the rocking method of hand-quilting? just use a stabbing motion for each stitch?.....so many things to consider! 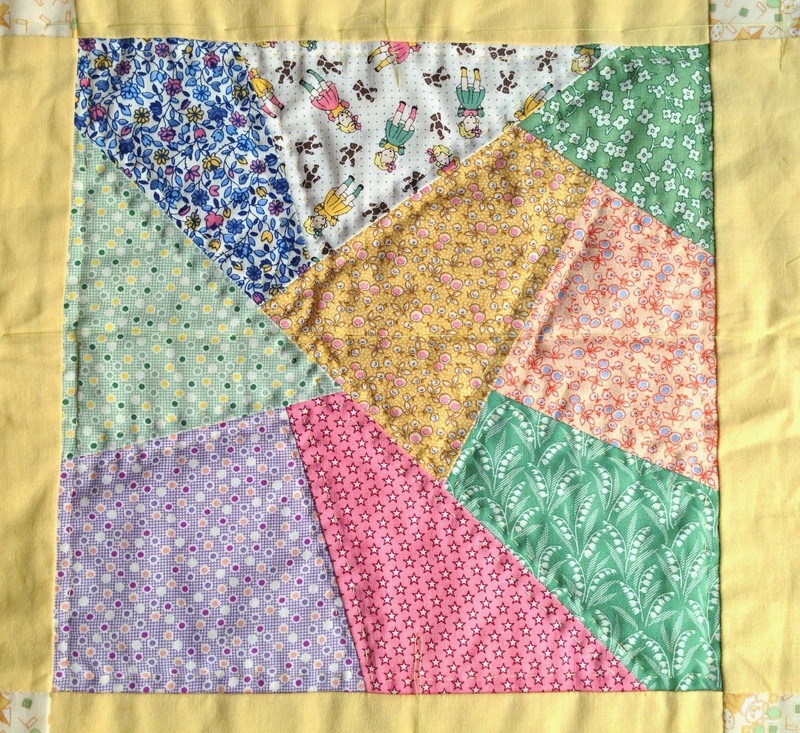 I do have some yellow quilting thread picked out, and I know I want to quilt just inside each of the small patches. So my goal for August is to make the decisions, get the basting done, and get at least six of the blocks quilted! 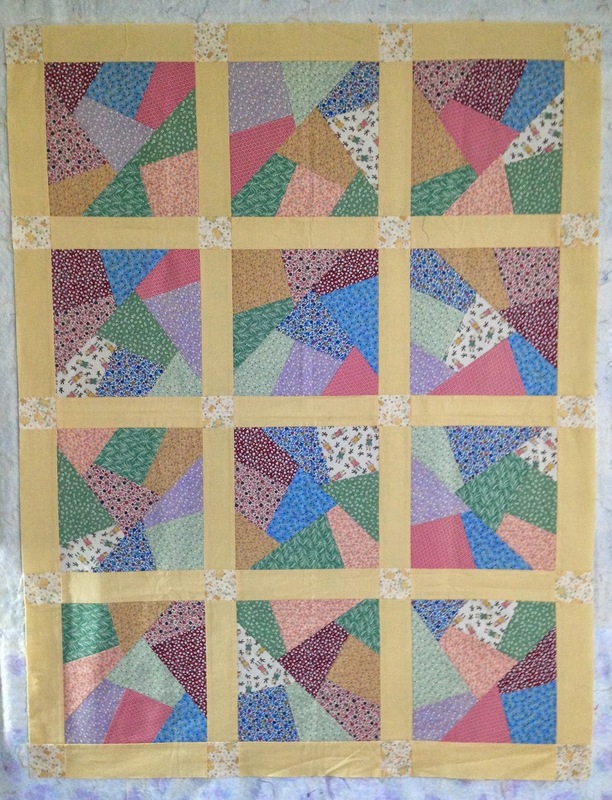 I may get more blocks quilted, but six would be a good start. And then there will be the decision on what to quilt in the sashings. (I think that I'm leaning toward a cable of some sort.) I do have more of the small print I used for the cornerstones to use as the backing, and the binding will be the same yellow fabric as the sashings. What are you working on this month? Be sure to check out all the goals that have been posted over at Sew Bittersweet Designs and Fiber of All Sorts. Give a word of encouragement to those who have posted goals, and consider making a goal of your own!